Located off the highway to San Blas on the Nayarit coast, our elegant executive beachfront home sits amid a grove of coconut palms just steps from the warm blue Pacific ocean, and over 5 miles of pristine sand beach. 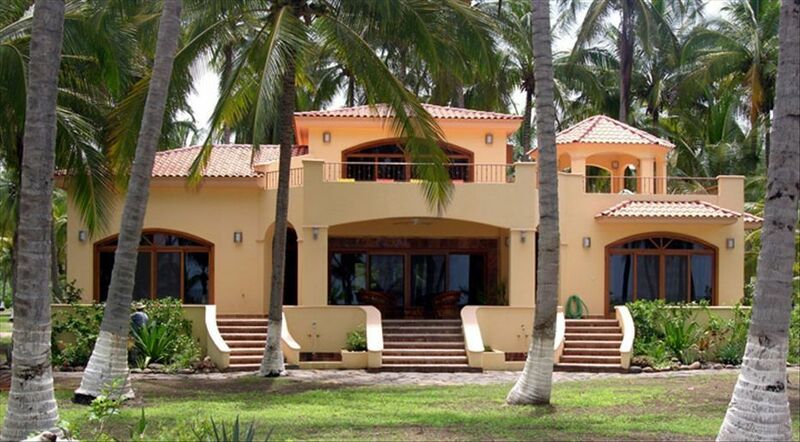 Casa Linda is one of 10 beautiful Villas for rent at Playa las Tortugas. Our Casa Linda is one of Playa Las Tortugas' most luxurious beachfront homes. From the well-appointed interior your ocean views are incomparable. This 3,400 sq. ft. beachfront home with over 1,000 sq. ft. of upper terrace is the very definition of "beach vacation"! Just steps from the ocean, Casa Linda is a large two bedroom home with loft. Our loft area has a king size bed and a very comfortable queen size futon for additional sleeping. Casa Linda has three baths, a more than ample custom kitchen with granite counter tops, stainless steel appliances, and with maid service included. Landscaped gardens surround our home, and there is a community pool for guest use. The main interior living area of the house has a two-story ceiling, giving an atmosphere of openness. From the living room you walk out to a covered sitting and dining veranda just steps from the beach. Carefully selected furnishings and decorative pieces throughout the home, joined together by native marble floors, spectacular onyx bath countertops, and highlights of "tikul" stone create a comfortable and eye-pleasing atmosphere. Custom built cabinetry in the family room adjacent to the kitchen contains a television, VCR, DVD, and stereo system, with a supply of recent movies for your enjoyment. The granite countertops, maple cabinets, and stainless steel appliances of the gourmet kitchen accommodate both casual and more serious chefs. Four adults can sleep comfortably in the two bedroom suites, with a fifth adult or two children (6 years and older) in the loft. The large master suite has its own private bath, with dual shower-heads, an incredible view to the ocean and it's own ocean view patio and separate beach entrance. Two additional full size baths serve the second bedroom and loft. From the loft walk out on to your upstairs terrace with sunning areas, kiosk for shade, and a custom BBQ grill and wet bar. From here you see the two hammocks hanging just up from the sand of the beach. Just bring a book and a bathing suit or, if you are a sportsman, we have kayaks and boogey boards for your use. We can send you information on where to rent surfboards if you don't bring your own. You can also fish in the boca or in the surf. We are adjacent to a turtle sanctuary. During turtle hatching season, you can participate in the night walk and assist in guiding the baby turtles to the water. To our east just behind the property are 1100 acres of mangrove estuary with many species of birds. If you would enjoy a beautiful, serene, remote setting in a coconut grove on the ocean in central Mexico, you will love our home at Playa Las Tortugas. Our entire state of Nayarit area enjoys one of the most favorable climates in the world. Average daily year- round temperatures range from highs of 80-85 degrees (perfect beach weather) to lows of 60-70 degrees (perfect sleeping weather). Swim year round, but consider packing a light sweater for the evenings in the winter months. Rain, when it falls, generally occurs between June and September as night-time or pre-dawn thundershowers. Playa Las Tortugas has kilometers of uncrowded, clean sand beach, and a number of activities both on property and nearby such as Surfing, Wave Kayaking, Boogie Boarding, Fishing, and Shelling, Canoeing, Whale Watching, Bird Watching, Walking or Running on Miles of warm Sand Beach, and Sea Turtle Conservation activities (during season) at the Sea Turtle Conservation Camp. Frequently there is one festival or another in small towns within an hour of our location. There are a number of excursions you might take, with or without a guide. We are happy to arrange transportation for you in our private shuttle, you may rent a car and drive your self which a large number of our guests do, or if you'd like to be more adventurous you may decide to come by bus and local taxi. We can send you details on the numerous car rental companies, or instructions on which buses and local taxis to take including approximate costs. It's quite easy to find your way from the Puerto Vallarta (PVR) International Airport to Playa Las Tortugas, and the roads are normally well-maintained. Come visit our home at Playa Las Tortugas! Playa las Tortugas is a gated community in a rural area. Plenty of beauty, peace and tranquility. Not for the party person, unless you bring your own! Relax on your front veranda, watching dolphins play in the surf!